Workamper News magazine is printed bi-monthly and has a readership 8,000+ in print and another 30,000+ that have access to the online digital version. The magazine is mailed to Workamper Diamond, Workamper Platinum, and Employer Gold members and is also placed on this website in the Online Magazine Archive. The current issue and our previous issue archive can be viewed online by Workamper Diamond, Workamper Platinum, and Employer Gold members. Advertising in the magazine can provide you with applicants for years to come. Our Workamper Intro, Workamper Gold, and Employer Intro members can view one previous issue online; the issue that was published before whatever the current issue is. Employers and other advertisers can place ads in each issue. You do not have to be a subscriber to advertise, but it can provide you with discounts. Since July 2012, the magazine has been printed in full color. The online version is a full color PDF that can be saved, printed and keyword searched. Workamper Opportunity ads are organized by state. Advertising must be submitted by 4 p.m. Central Time on the deadline day for that issue. Also, if you need to cancel an already scheduled ad, the deadline is the same. The issue is mailed out and placed online approximately two weeks after deadline. Help Wanted ads are the bulk of Workamper News magazine. Ads are organized alphabetically by state. The cost for a text ad is $1.00 per word for Employer Intro members and $0.50 per word for Employer Gold members. Words that you submit in ALL CAPS beyond the first 3-5 words will be made bold, and are an extra $1 per word. Including a logo with your ad is free for Employer Gold members or $10 for Employer Intro members unless they are ARVC members. 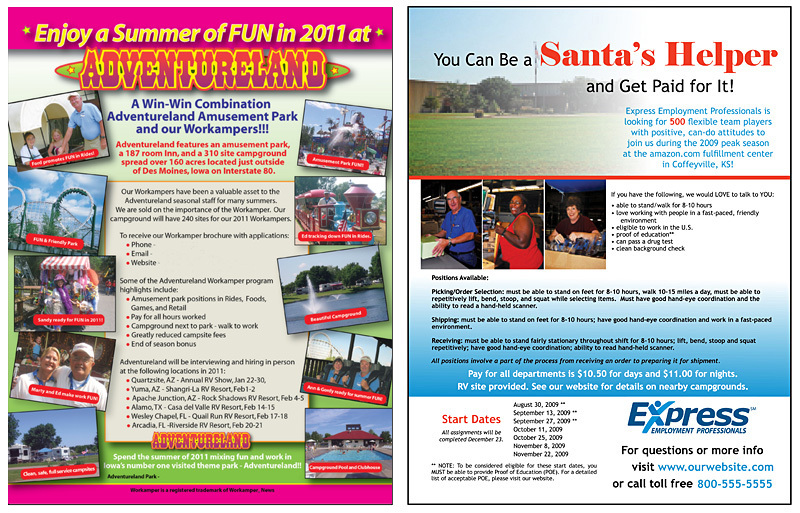 Add a 2pt black border around your ad for an additional $50 to make it stand out. The minimum ad cost for Employer Gold members is $25; the minimum ad cost for Employer Intro members is $50. Ad cost is per issue. We require a credit card for the payment of the first ad run by an employer. Future ads can be charged to credit card or we will email/mail you an invoice. The preferred method to submit your ad is to use the secure, online ad submit process. In this process, contact information needs to be entered so we can find your subscriber file, then select what issue(s) the ad should be ran in, payment method, etc. You will have a box where you can enter your ad text. Please be sure to include how you would like Workampers to contact you for employment in your ad text. Once you submit your ad, we will process your ad and send you a confirmation email. If you select to pay with a credit card, your card will not be charged at time of submission, but once a WKN staff member processes your ad. You can submit your ad to run in just one issue at a time, or select to run in multiple issues or "Run Till Stop." When you select the "Run Till Stop" option, we will schedule your ad as each issue comes up without you having to contact us to do so. To cancel an ad already scheduled, please notify the WKN office on or before the advertising deadline for that issue. A Column Display ad can include text, logos, graphics or photos; printed in full color. These type of ads provide some extra white space and graphic appeal. The cost is determined by size. The width is our usual column size - 3.625 inches. The height is determined by you and the amount of information you would like to include. Ad cost is $80 per inch in height, i.e. a four inch tall ad = $320, per issue. This type of ad can be designed by you if you have a designer/marketer on staff, or a WKN graphic designer can create some options for you. Ad design time $50/hour. Preferred file types: PDF, TIF, PSD; design in CMYK. Column Display ads need to be submitted 5-7 days before the issue deadline to ensure ample design time and/or to ensure the submitted ad file will print successfully. Please send an email to WKN Editor at editor@workamper.com or call 501-362-2637 with questions or to provide your ad file. You will need to email your ad text and any graphic/image files that you would like in your ad if WKN is designing the ad for you. Payment for this type of ad can be accomplished with a credit card or we can mail you an invoice at publication of the issue to provide you with a tear sheet of your ad. Half-page display ads are printed in full color, and may be ran on an inside cover, in your state section, or on an article page - depending on availability. The ad size is 7.5 inches wide by 5 inches tall. This type of ad can include text, logos, graphics or photos. This type of ad can be designed by you if you have a designer/marketer on staff, or a WKN graphic designer can create some options for you. Ad design time $50/hour. Preferred file types: PDF, TIF, PSD; design in CMYK. If you schedule your ad in multiple issues, discounts are provided. Half—Page Display ads need to be submitted 7-10 days before the issue deadline to ensure ample design time and/or to ensure the submitted ad file will print successfully. Please send an email to WKN Editor at editor@workamper.com or call 501-362-2637 with questions or to provide your ad file. You will need to email your ad text and any graphic/image files that you would like in your ad if WKN is designing the ad for you. Full-page display ads are printed in full color, and may be ran on an inside cover (depending on availability) or in your state section. The ad size is 7.5 inches wide by 10 inches tall. Or if you would like to do a full bleed (where the ad takes up the whole page and the color goes all the way to the edge), please make your ad size 9 inches wide by 11.5 inches tall (page size 8.5x11 with 0.125" bleed) to accommodate our printer's settings. This type of ad can include text, logos, graphics or photos. This type of ad can be designed by you if you have a designer/marketer on staff, or a WKN graphic designer can create some options for you. Ad design time $50/hour. Preferred file types: PDF, TIF, PSD; design in CMYK. If you schedule your ad in multiple issues, discounts are provided. Full—Page Display ads need to be submitted 7-10 days before the issue deadline to ensure ample design time and/or to ensure the submitted ad file will print successfully. Please send an email to WKN Editor at editor@workamper.com or call 501-362-2637 with questions or to provide your ad file. You will need to email your ad text and any graphic/image files that you would like in your ad if WKN is designing the ad for you. The back cover ad space is a highly visible location, and availability can be limited so please schedule early. The ad size is 7.5 inches wide by 7 inches tall. This type of ad can include text, logos, graphics or photos. This type of ad can be designed by you if you have a designer/marketer on staff, or a WKN graphic designer can create some options for you. Ad design time $50/hour. Preferred file types: PDF, TIF, PSD; design in CMYK. If you schedule your ad in multiple issues, discounts are provided. Back Cover Display ads need to be submitted 7-10 days before the issue deadline to ensure ample design time and/or to ensure the submitted ad file will print successfully. Please send an email to WKN Editor at editor@workamper.com or call 501-362-2637 with questions or to provide your ad file. You will need to email your ad text and any graphic/image files that you would like in your ad if WKN is designing the ad for you. The Workamper Classifieds section runs toward the back of the issues. Ads that can be included in the section are Campgrounds/Businesses for Sale and RVs for Sale. We also have a Marketplace section for RV-related products. Ad cost is $1.50 per word, with a $45 minimum, per issue. To submit your Classifieds ad for the magazine, please use the secure online ad submit process and submit by the issue deadline shown at the top of the page.